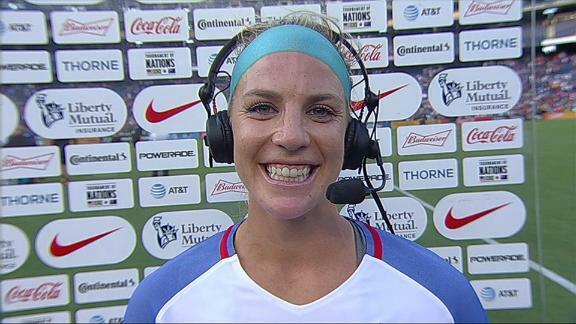 Julie Ertz joins Ian Darke and Julie Foudy to discuss the USWNT's improbable comeback against Brazil and her winning goal. SEATTLE -- Sydney Leroux made a name for herself in large part because she was faster than everyone else. She moved more quickly through life, ascending to the sport's top levels sooner than most, and more quickly across a soccer field, outracing defenders on her way to goal. Making her first appearance for the U.S. national team in two years as a second-half substitute Sunday against Brazil, Leroux is building a comeback on patience. She is taking her time, content for now to keep pace with the pack. Not so much the hare turned tortoise, she would like to think, but a hare who thinks the tortoise has a point. For now she needs to stay only one step ahead of someone who has to this point mostly crawled. Not that her son, Cassius, closing in on his first birthday, makes it easy for her all the same. "I have something that takes me away from the game, which I think is so important," Leroux said of motherhood during the Tournament of Nations. "Before I had him my entire life revolved around soccer. And if something went wrong with soccer it pretty much took over my entire life. Now I have a little bit of perspective when something bad happens. Losses aren't as hard. I have something that is bigger than soccer, and I've never had that before." As a substitute in the 76th minute Sunday, Sydney Leroux made her first appearance for the U.S. women since the 2015 World Cup semifinals. She never had much time for anything but soccer. She crammed a lot of it in her first 25 years. Seven years ago, a few weeks before she took the field for the United States in the 2010 Under-20 Women's World Cup, Leroux reflected on her first appearance in that event. The daughter of a Canadian mother and American father, she made the Canadian roster for the 2004 edition of the same tournament in Thailand (technically an under-19 event at the time). She was just 14 years old back then, not even a high schooler in an event that is often the final stepping stone -- an event that helped introduce Marta, Dzsenifer Marozsan and Alex Morgan. Making that Canadian team was an accomplishment. It was also the first time she had to sit and watch from the bench. At 14, it wasn't easy to be patient. "It still broke my heart," Leroux said in 2010 of the reserve role. "I just remember sitting on the bench and trying to hold back tears because I wanted to play so bad." If she was as pained about sitting on the bench in recent months, she didn't show it. Leroux was part of the roster that traveled to Europe to play Norway and Sweden in June, her first inclusion since the birth of her son, but she didn't play in either game. She didn't play in Thursday's Tournament of Nations opener against Australia, either. 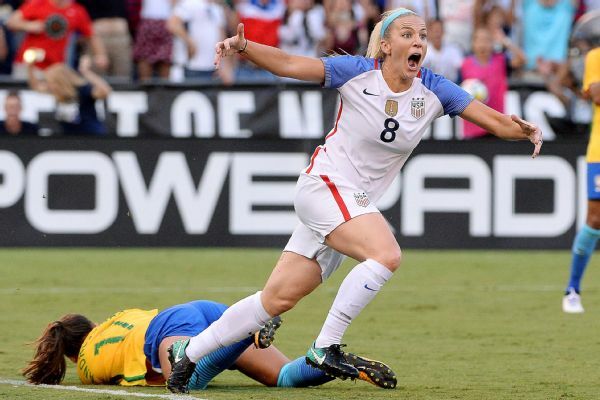 Not until the 76th minute against Brazil did she take the field for the United States for the first time since a World Cup semifinal against Germany in 2015. First came the ankle surgery that sidelined Leroux for the duration of the victory tour after that World Cup triumph, then pregnancy took her out of contention for the Olympic roster. 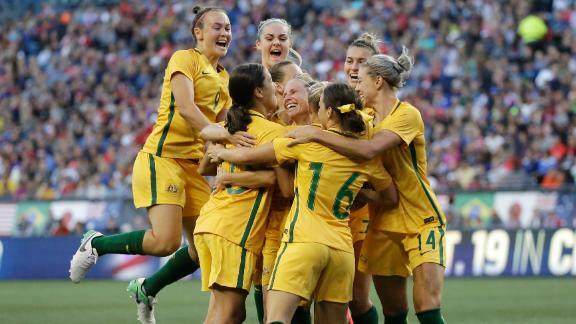 "It's remarkable she is, at this point, where she is," U.S. coach Jill Ellis said. "But I think she's not -- and I think she would agree -- she's not back to where she wants to be, in terms of a prolific goal scorer." That is a work in progress, too, in Leroux's club duty. 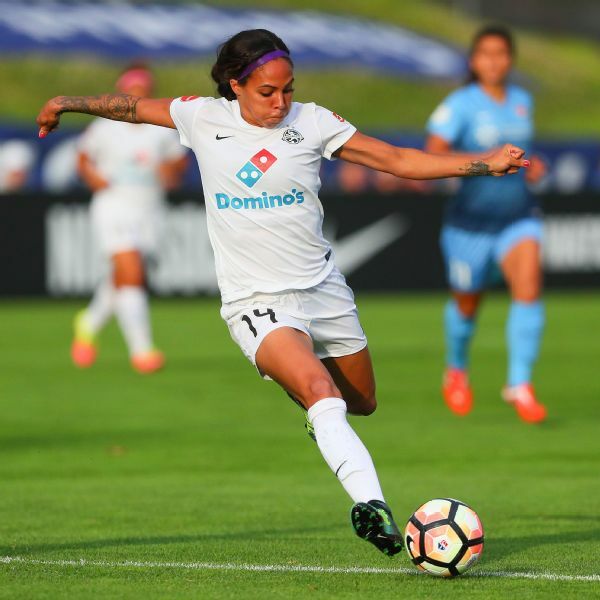 Although she entered the international break fifth in the National Women's Soccer League in shots, that volume had produced a modest three goals for FC Kansas City. A rare combination of power and speed at her pre-pregnancy peak, she said it initially felt like she was running under water when she returned to the field. It feels better now but not like it was. Not yet, at least. But in almost the same breath she made that concession, she said there are ways in which she feels she is a better player now than she was before Cassius. She argues that necessity, and a lot of time to study the game, served her well. "I think I'm better playing in front of the line," Leroux said. "Before I was pregnant I was trying to get in behind the back line all the time. Now I feel like I'm able to come and find the ball and find spaces and maybe me be the person that plays the final ball or who switches the point of attack. "I've had to learn a little bit more of a different game because I haven't been able to use my speed the same way." That would serve her well, if displayed on the international stage. There are few players Ellis knows better than Leroux, the star whom the coach recruited to UCLA as a teenager, coached in that Under-20 World Cup and started in the opening two games of the 2015 World Cup. For all of that, it remains to be seen if Leroux can carve out a place for herself on this team again, if she can force Ellis to look to the past amidst all the new faces and new direction. Leroux faces a crowded depth chart, not just from players like Alex Morgan and Christen Press with whom she formerly shared national team minutes as forwards, but new and evolving roles for players such as Crystal Dunn, Lindsey Horan, Carli Lloyd and Lynn Williams. Before I had [my son] my entire life revolved around soccer. ... Now I have a little bit of perspective. "I think it's just a really good dialogue her and I are having, her being realistic in terms of where she is," Ellis said. "So we've had a couple of conversations. And while a lot of things are coming back for her, it's another step in terms of the international level. I think she realizes that. Right now what I think she appreciates are just the opportunities in here to kind of get back into that tempo and that physical component of it, as well -- it's just a lot faster." It always seems to come back to speed with Leroux. But she is growing adept at handling the speed with which life comes at her, be it the pace of international opponents, the professional reality of seeing husband Dom Dwyer traded last week from Sporting Kansas City to Orlando City in MLS -- lighting the fuse on the expected rumors that Leroux will soon be on the move again in the NWSL -- or just the everyday activities of a toddler. There are no certainties for Leroux's international career at this point. Just like life. "Being able to compartmentalize my life and balance is always a challenge," Leroux said. "But I think there is something so amazing in the fact I can come back from practice and sit back and say, 'I just played soccer and now I have to go be a mom.' It's really cool. It's a lot of work, and it's tiring, but it's amazing." It is, all things considered, a pretty good time to be Sydney Leroux. No wonder she's in no hurry.